The local grocery store I shop at was having a buy 1 get 1 free sale on roasting chickens -PERFECT! I was in the mood to make a roast chicken and wanted something simple to use for other dishes later in the week (be on the look out for a new recipe later this week). So I just threw this “recipe” together and it turned out perfect. Mix together 1 Tbsp of each of the following: onion powder, garlic powder, oregano and add 1 tsp of thyme and some salt and ground black pepper. 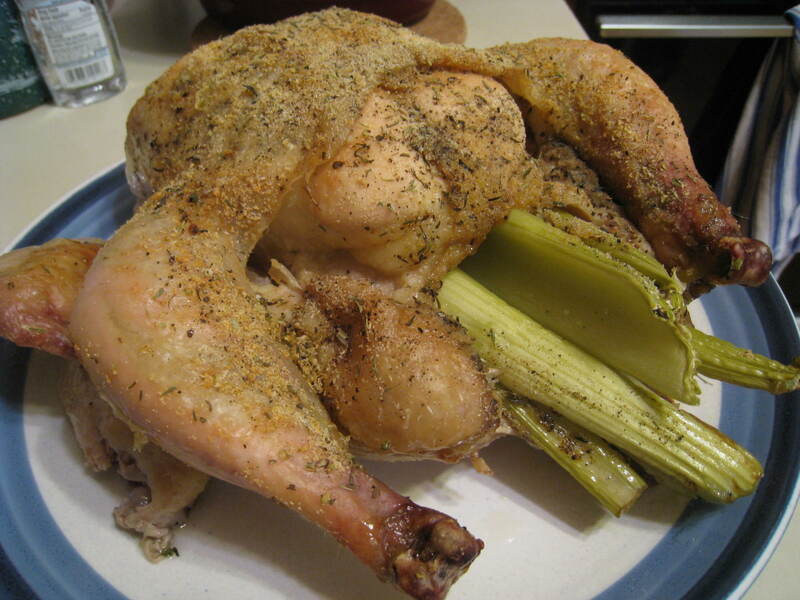 Rub the dry mixture all over the chicken (inside and out) and then stuff it with a couple stalks of celery. Roast in the oven at 25o degrees for 4 hours or until done.